Mondo grass, which is native to Japan, is not actually a grass but a lily. 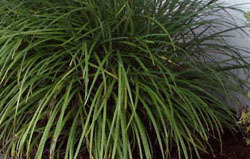 It is versatile for creating a formal look especially as a border plant. The weeping leaves create a soft look. It spreads slowly in a clumping style. It can also be used as a lawn in areas where there's no traffic or in Japanese gardens. Whilst it can last for years undisturbed, well established clumps can be divided enabling you to plant out more areas in the garden. Note: this is a different species (smaller and finer) to the Giant Mondo which we have listed under "Lily Turf."